This afternoon my wife wanted to go into town to spend some money on herself so I asked if I could get some cycling practice in before my first ride to work on Monday. 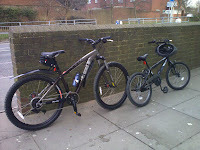 She agreed and I took my eldest son (aged 10) out with me for a ride. I decided to go back to Shinewater Park as most of it is totally flat and there is no traffic. My backside wasn't hurting anywhere near as much as I thought it would, however my legs were a bit sensitive. We took a lap around the park and headed home via the shops. The short run from the top of my road is a nice hill and managed to top 21mph! I was very impressed with this.